One of the most significant decades in human history also signaled a dramatic shift in clothing. Men's fashion in the 1940s enjoyed what some consider its last great hurrah in elegance and style. It was an era that began with practical styles because of the war, and ended with more extravagant fashions celebrating the end of strict rationing. As the Great Depression came to an end and war descended on Europe, fashion for both men and women was dictated by economics more strongly than it had been during the first world war and the 1930s. The war meant Paris and Italy were no longer fashion leaders, and strict rationing -- beginning in Britain in 1939 and America in 1941 -- meant designers had their work cut out for them. Substance mattered more than style. Everyone needed practical, sturdy clothing; and no one wanted to be accused of a lack of patriotism by wearing something too flashy. Natural fibers weren't used for civilian wear because they were needed for uniforms. Men's suits lost their vests, pocket flaps and trouser cuffs. Since most of the men were at war, those who remained at home mostly wanted to look as austere as possible. The end of the war and rationing in America saw the development of the style most often associated with the swing era. Clothes were full-cut again, double-breasted and longer jackets and wider trousers. Shirts and coats came in a range of colors and hand-painted silk ties ran the gamut from elegant to exotic -- featuring geometric designs or pin-up girls. Everyone wore a tie and through it, a man could express his individuality. Even today you can see shades of the suits that were popular in mid to late 1940s. During the war, civilian men generally wore plain, functional suits in solid, plain colors like navy or black, with plain white shirts, and very little embellishments. 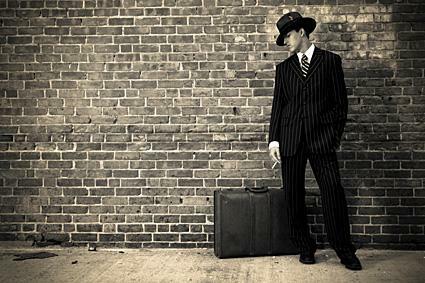 After the war ended, the working man could go to the office in the elegant suits usually associated with the 1940s emerged. The most notable new design was the Esquire jacket which featured a loose fit and broad shoulders common in many men's suits today. Men also wore double-breasted jackets that featured center vests and peaked lapels. Single-breasted suits with notched lapels also emerged post-war. Men favored wide, short ties in a Windsor knot and came in colorful patterns and accessorized with decorative tie pins. Although white shirts were still widely worn with suits, many other colors were available after the war. Pleated trousers were full-length, loose cut with or without cuffs. Men often chose leather wing-tip shoes and cap toe shoes with laces in brown or black or two-tone colors. The Jazz Era's wide suit, hugely popular in Harlem in the 1930s, was worn predominately by African-American and Mexican-American youths in the 1940s. It was considered unpatriotic and even illegal because it went so far against the standards of rationing. The fact that so many of the Mexican-Americans who wore it were gangsters did not help its reputation. However, the high-waisted, baggy and low-crotched trousers with the narrow ankle and oversized jackets had a powerful influence on men's fashions in the 1940s. Besides being an ideal outfit to wear while jitterbugging, the high waists and boxy, roomy coats were flattering, as well as comfortable. They gave a man more substance, something he wanted to project during such desperate times. The look most commonly associated with men's fashions in this decade was what a man wore to take his honey out on the town. If he wasn't in uniform, his look was strictly adhered to by today's swing revivalists. Daring young men wore zoot suits, but others simply took off their single-breasted jackets to dance and showed off their style through their accessories. Even after the war, accessories really made the man. The tie, as mentioned above, was crucial. In the 1940s, high-cut trousers meant ties were shorter and wider. They were brightly colored when everything else was austere. They were also held in place by clips because nobody wanted put a pin through their good tie. Shirts were held in place by good cufflinks and dressed up by suspenders, which fastened to the trousers by buttons. Suspenders were especially popular when all the leather used make belts went to the war effort. 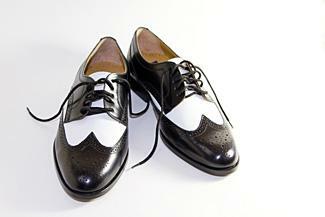 Almost everyone wore wingtip, spectator shoes, which were not terribly different from men's shoes in the 1920s or 1930s. When not wearing an Army-issued cap, a man distinguished himself with his wide-brimmed fedora. 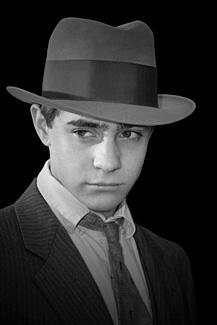 A smart, strong, stylish hat, the fedora was worn by everyone from gangsters to businessmen to President Roosevelt. The brightness and promise of the post-war years saw men looking for fun and leisure. There are several distinct fashion staples that dominated the post-war era of the 1940s, and it seemed as if experimentation was the name of the game. Among the most coveted designs were long coats and full-cut trousers thanks to wartime fabric shortages. Also popular, albeit a bid garish, were the popularity of hand-painted ties featuring landscapes, pin-up girls and rodeos. Arguably, however, no fashion trend dominated more after the war than the casual shirt. Hawaiian shirts escaped their roots from the shores of California beaches and expanded to men all over the country in the 40s. Men's dress suits also became liberated after the war, as single-breasted jackets with pronounced shoulders, three buttons and notched lapels were all the rage for office and formal menswear. Considering how traditional things were in the 1940s, it may be hard to believe that men were so daring and experimental with their fashion choices. Whether opting to wear Hawaiian shirts, zoot suits, hats or hand-painted ties, 40s men took fashion risks that paid off. The result was stylish, tailored and fabulous.